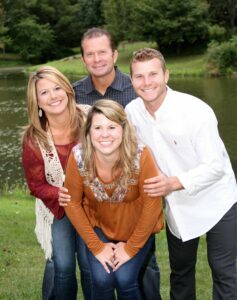 The Barrick family had two choices after an unthinkable tragedy: to allow themselves to be torn apart or to draw closer to one another through deeper relationship with God. Driving home from church after a normal day of family events, just a mere half-mile from home, their family van was hit head on by a drunk driver. Their lives were instantly changed forever. The new reality for the Barrick family was both confusing and crushing. The family van looked more like a crushed tin can than a vehicle. The four family members-Andy, Linda, Jen, and Josh were all sent to different hospitals to be treated. Jen, at fifteen years old, was not expected to live. Her head was gashed open, skull crushed, with her brain visible to the first responder on the scene. In a coma for five weeks, Jen’s future was anything but promising. The accident occurred on November 5, 2006. On March 2, 2019, the entire family of four attended the Inspire 2019 Women’s Conference in Burlington, North Carolina, where Linda and Jen were featured speakers. You read that correctly-Jen was a speaker at the conference. Over a period of many years, God miraculously healed Jen one step at a time. To hear the story of how Jen could not carry on conversations with her family but could clearly pray, sing hymns, and recite scripture brings chills to the surface. God is speaking through Jen and the entire Barrick family. At the Inspire 2019 Women’s Conference, we sat down and chatted about their tragic accident, forgiveness, healing, and ministry. In the early days after the car crash, each member of the family developed their own individual and unique relationship with God. They believe that is what saved their family. Being closer to God brought them closer to each other in unity like never before. Their family was forged in the fire, strong beyond what any words can describe. Even though the Barricks were a close knit family before the accident, God brought them together in a special way after the horrific crash. Even though they would never choose to go through the pain that they suffered, they can praise him through it all. At the conference, Jen read a letter she had written to the drunk driver that nearly ended her family. Jen not only offered forgiveness but daily prayer for the man that caused her and her family much suffering. Jen described her forgiveness of that man much like the forgiveness Jesus offered for her. 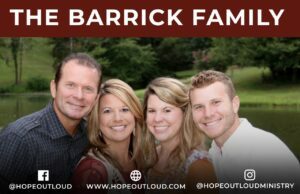 In a time when the family is under attack from every direction, the Barrick family provides inspiration that the unthinkable does not have to destroy our faith. Linda Barrick decided she was fighting back against Satan and his attack on her family, as did Andy, Jen, and Josh. They did not crumble. They looked to their Savior and found strength through Him. And they share that hope every chance they get. Hope Out Loud Ministries was born from the Barricks desire to share Jesus and hope to as many people as they can. They believe they were left here on Earth to share Jesus and all that He has done in their lives. To learn more about their ministry and schedule of upcoming events, visit www.hopeoutloud.com. To learn more about the accident and Jen’s recovery, pick up Miracle for Jen and give it a read. You won’t be able to put it down until you hit the back cover. My interview with the Barrick family ended with Jen telling me that she doesn’t want to be remember as the girl with the traumatic brain injury. She wants to be remembered as the girl who loves Jesus with all her heart. Well Jen, you have your wish. 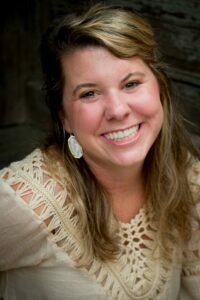 Melissa Cole, also know as "Teal Mom" is the Editor of Central North Carolina Voice and author and food allergy advocate. She is a devotional writer featured in The Secret Place. Melissa’s writing has also been featured in The Liberty Leader newspaper and The Courier-Times newspaper. She is a featured blogger and guest blogger on AllergyCloud.com, an allergy resource page. Melissa also serves as a Sunday School teacher at Mt. Zion Baptist Church in Liberty, NC and has served in many capacities at Mt. Zion, including as the Mothers of Preschoolers leader, a Children’s Church teacher and a Girls in Action leader. She is currently pursuing a Master of Arts degree in Christian Ministry from Liberty University. Melissa lives in Central North Carolina with her husband Jon and four wonderful children, Ashlynn, Jonathan, Annemarie and Jaxon. Melissa is represented by Caroline George of Cyle Young Literary Elite. Follow her blog at MelissaColeAuthor.com.